In many ways, dumbbells are much better than barbells. It allows you to target the muscles in a particular arm. This helps a lot if you’re a tennis player, since your dominant arm will be more stressed and you’ll need to focus more on your other arm to balance this up. In addition, you don’t need as much space to use dumbbells. They’re also safer, since you don’t need a spotter to keep you from getting crushed. Using barbells without a spotter can be dangerous, or you will have to spend more money on a power rack. However, getting fixed-weight dumbbells can be problematic as well. 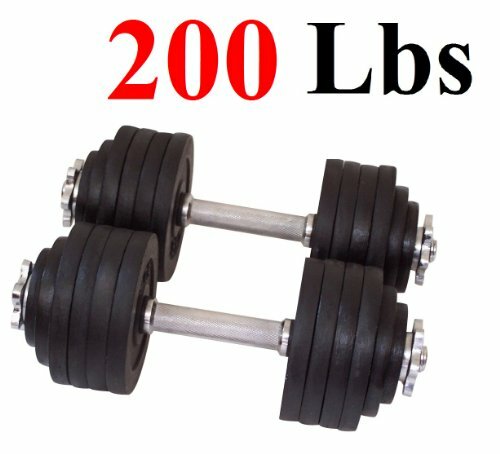 You will need a lot of them so that you can progress and use different weights in your workout. However, you can opt to use adjustable dumbbells instead. A single pair of dumbbells can take the place of 16 or more separate dumbbells. 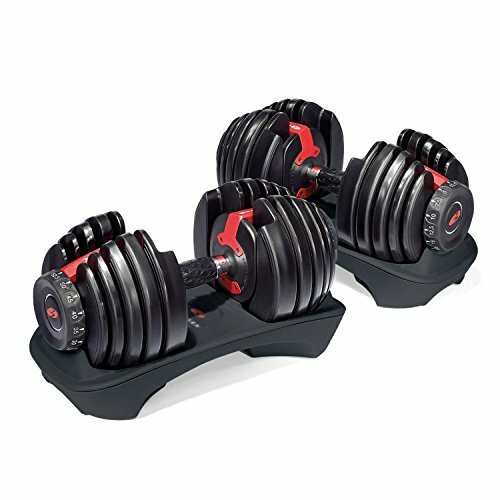 The best adjustable dumbbells offer a range of weight that’s right for your strength and skill level. The weight changes should allow for small incremental change as well. It should be easy to adjust the weight, and the metal plates should be secure in their place. 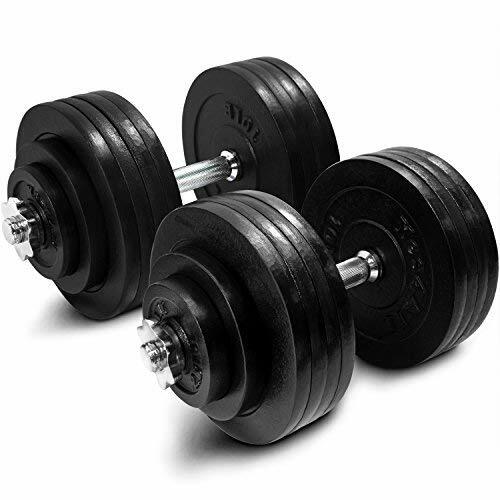 The handle should be comfortable, and the dumbbells should last for a long time. 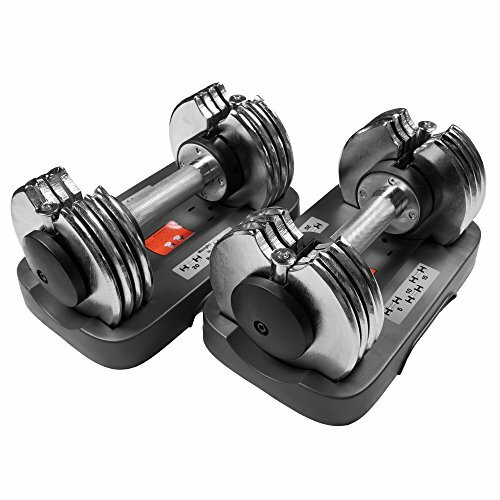 This is the classic set of the adjustable dumbbells. Using a dial system, the weight can go from 5 pounds to 52.5 pounds. For the first 25 pounds, you can change weights in 2.5-pound increments. You just have to turn the knob to change weight. With this set you can go as high as 100 pounds for each dumbbell. That makes it suitable for huge power lifters. The textured chrome handle features a non-slip grip. The cast iron plates have a black paint finish for rust-resistance for lifetime use. It goes from 4 pounds to 45 pounds in 5-pound increments. There’s a dial you turn to determine the weight. 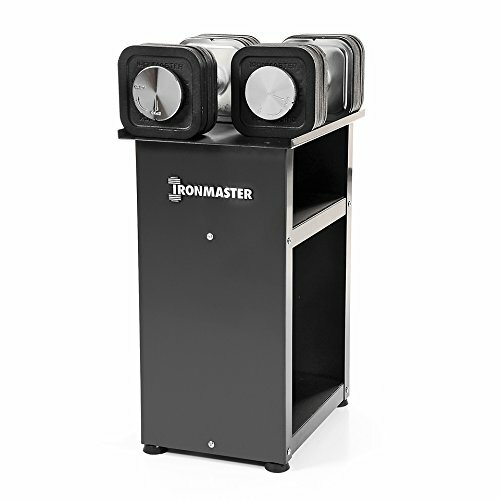 The stand is at the perfect height to for quick access, and for turning the weight selector dial easily. 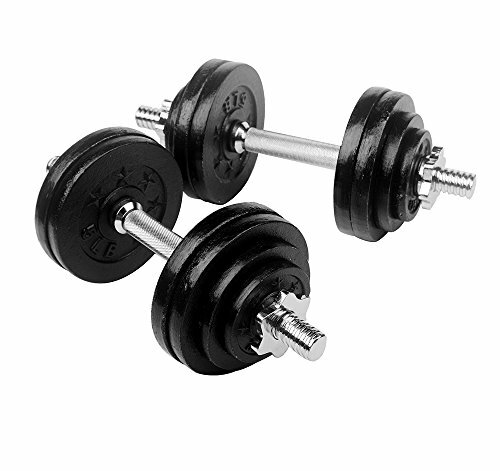 Each dumbbell in this pair can go up 100m pounds, and with increases in 5-pound increments. The handles are textured and made of chrome and the weights are cast iron. Both the handles and the collars are threaded so that the weights stay in place. This is sold in single units, but you can always buy 2. It’s pretty much the same as the 552 except this goes from 10 to 90 pounds. The plates are also covered in durable molding so they’re not too noisy to use. 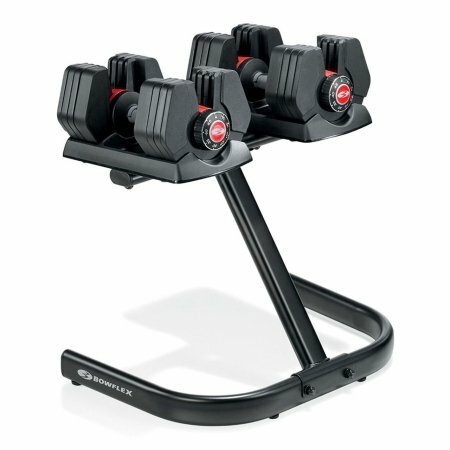 This goes from 5 to 90 pounds per hand, and it’s adjustable in either 5 or 10-pound increments. 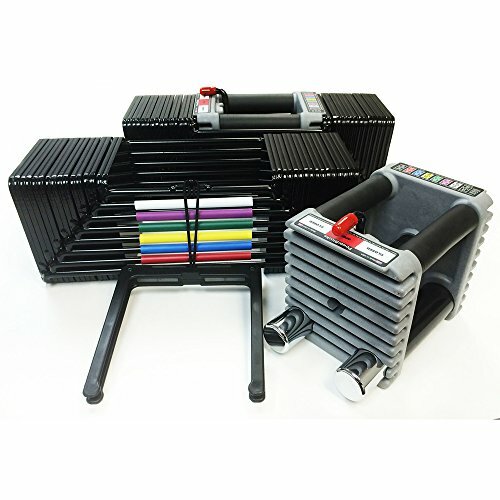 If that’s not enough, there’s a kit that lets you go up to 130 pounds per dumbbell. It’s compact, well-balanced, and very durable. It’s made in the US and it has a long warranty. It goes from 5 to 75 pounds in 2.5-pound increments. The design allows for very quick weight changes. It’s compact as it doesn’t take up more than 2 square feet. As for the durability, it comes with a limited lifetime warranty. Each dumbbell goes from 10 to 50 pounds in 5-pound (or even 2.5-pound) increments. It uses chrome-plated steel for heavy duty use. 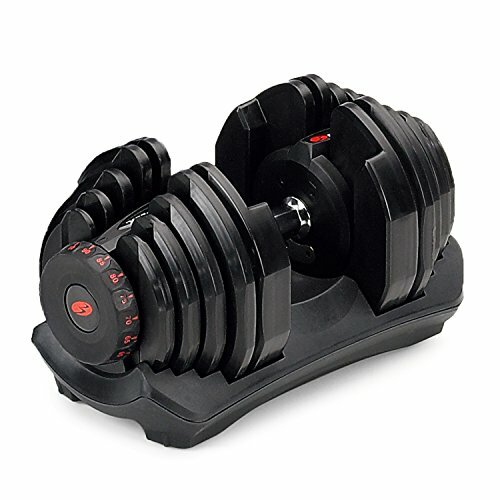 It’s very compact, and changing the weights is easy and quick. This goes from 5 to 50 pounds for each dumbbell. This time there’s no dial and no pin whatsoever. 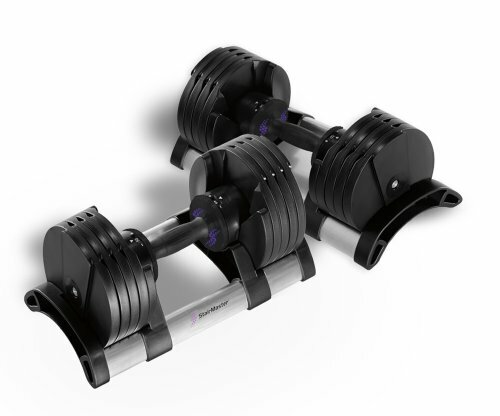 With the TwistLock, you just hold the handle as you place the dumbbells on the docks, and you twist a little to get the weight you want. That’s it. It goes from 5 to 52.5 pounds in 5-pound or 2.5-pound increments. The handles offer a secure and comfy grip. It also comes with a rubber cushion for the nut that holds it in place securely.